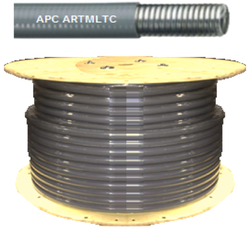 For industrial and commercial use in the wiring circuit protection in extremely wet or damp areas. It is also suitable for the protection of electrical cables machinery, tools and equipment that do not require listed product. For internal and external use. ⅜”, ½”, ¾”, 1”, 1¼”, 1½”, 2”, 2½”, 3” & 4”. Standard coils & master reels available.